A guide to the 80's pink-haired rockstar, the animated series, collectibles and beyond! 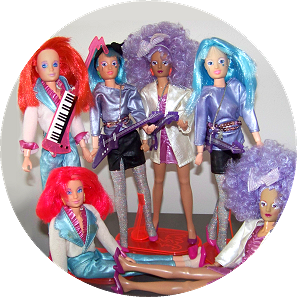 In 1986, Hasbro's fully articulated rockstar dolls entered the fashion doll market with their wild hair colors, a glamorous fashion line, and playsets with built-in real musical features. These colorful dolls, incorporated with the musical theme, were far beyond what had previously been known as the typical fashion doll. And they made a lasting impression that would continue to impact the doll industry for decades. These pages will cover the 80's line, aswell as the 2012-2017 commemorative collectors line. You will find reviews and large colorful pictures of all released products from the doll line, and even pictures of every single item that came with the dolls, and many of the fashions and playsets aswell. This guide also digs a little bit deeper into detail about doll variations, international releases/availability, and a cartoon comparisons. Hasbro had great plans for promoting this line, which was their new flagship, after successful lines like My Little Pony, Transformers and G.I. Joe. In addition to an animated television series, the Jem line was to be supported by an agressive advertising campaign, aswell as promotional support programs. The Jem dolls were more advanced than the common fashion doll of the time, with their 12½ inch bodies, with realistic poseability of head, arms, wrists, waist, legs, and bendable elbows and knees. All of them came with a bunch of accessories, like a hairpick, poster, and a stand. On top of that, the main character Jem came with flashing earrings, two haircolors and an extra outfit to change into Jerrica. Most of the other dolls in the lines came with an instrument, aswell as a real cassette tape with extended versions of the songs featured in the cartoon (and instrumental versions). Even the colorful boxes themselves were made to draw attention at first glance, with fantastic artwork interpretations of the dolls. All of the dolls, aswell as fashions and playsets, had "Jemstar Points" printed on the back of the boxes, which were to be cut out and mailed in along with a special offer for special items. There are some more or less noticable variations of the dolls, when it comes to hairstyles, make-up, bodyshapes (torso, hands, feet...), fashion fabrics, accessories (stands), and even the boxes. Partly because the dolls were made in several different countries like China, Hong Kong, Spain and Mexico, but also because some improvements were made even after the first shipments were made to the stores. The cartoon characters were based on the look of the dolls, or rather the prototypes of the dolls. Some of the cartoon interpretations were later changed to resemble the dolls more in terms of hair, makeup, and outfit. But also some other interpretations were made, like the artwork on the doll boxes, and the art in the books. Where the dolls were made, is not the same thing as what country they were made to be released in. This category will mention what country the dolls were made to be released in, and even if dolls weren't specifically made for a certain country, this will mention if a doll was available there and what version. Some of these dolls had further variations, especially the Mexican dolls. Here is some general info from some countries, but more info will follow listed for each doll. In Italy, all the first edition dolls and some second editions were released at the same time in 1987, before the cartoon. The dolls said "delle Holograms" and next to "Truly Outrageous" it said "Rock 'n Shock". In 1987, two different Jem doll commercials were shown on the TV channel Italia 1. In the first commercial two young girls play with the Jem's dolls, and the second included a short version of the Jem theme song, without the Misfits. In Sweden the dolls were released in 1987, and were available only in some stores. There were dolls from first and second year released at once, fashions from On Stage, Glitter 'n Gold and Music Is Magic collections, and playsets like the Star Stage and Rock Backstager. Probably all dolls released (except for Glitter 'n Gold Rio) were made in China. In Mexico the dolls were made by another company, owned by Hasbro, called Iga - Juguetes Con Vida. All female dolls from the first year were available. Instead of "Truly Outrageous! ", Jem was "Es Fabulosa!" which it said on the posters aswell as the doll boxes. The boxes also said "de las Holograms". The dolls are easy to tell apart from Jem dolls made anywhere else, because they have no markings, and the plastic have a different look, color and feel. The makeup looks a bit different. The fashions, or atleast the lamé parts, were made of a more fragile and less metallic looking material. 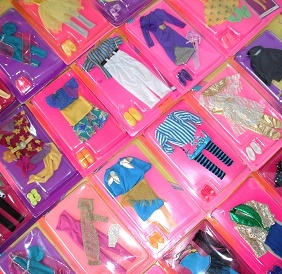 In Germany probably all of the first edition dolls, fashions and playsets were available. Here the boxes said "von den Holograms". In the doll boxes was a tape with stories in german mixed with songs in English. In Spain the doll boxes said "Verdaderamente Fantastica" instead of "Truly outrageous! ", the boxes also said "de las Holograms" like in Mexico. In Holland the doll boxes said "van de Holograms", and underneath "Truly Outrageous!" it said "Vraiment Extravagante!". "Glitter 'n Gold" Jem and Rio were called "Rock 'n Gold", and "Flash 'n Sizzle Jem" was called "Rock 'n Flash Jem". In France the boxes said "Elle est fantastique!" instead of "Truly Outrageous! ", and "du groupe Holograms" or "des Holograms". In the United Kingdom atleast the first edition dolls were released. On June 27, 2012, 25 years after the previous Jem doll was released, it was announced that the doll company Integrity Toys in close collaboration with Hasbro was creating a new official commemorative doll line, destined to adult fans and collectors. Unlike the 80's line called "Jem - Truly Outrageous", the line is now called "Jem and The Holograms". 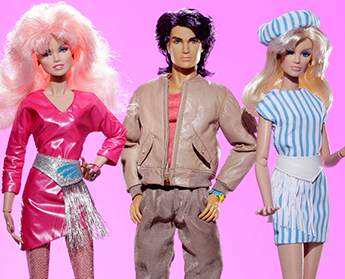 The design team includes Jem fans (Alain Tremblay responsible for packaging, and Vaughn Sawyers for designing the look of the dolls and fashions), who are designing the dolls with a retro look, made to resemble what Jem looked like in the 80's, in a combination of the cartoon and dolls. The dolls feature a brand new 12 inch (30.5 cm) fully articulated body sculpt. While the male dolls (12.5 inch) were to come in an already existing Integrity Toys body sculpt. Unlike the 80's dolls, the new thinner size of the body shape enables the dolls to wear fashions from more other fashion dolls, like most of the Integrity Toys doll lines. The head has a smaller and more natural look. The dolls come with interchangeable hands aswell as alternative hands that will allow the dolls to be posed differently and hold accessories. The feet are smaller, but still larger than other dolls by Integrity Toys, and for the males the feet are removeable. The characters were made to look more like their cartoon counterpart, but with a more detailed makeup scheme. The female dolls feature such details as hand-applied eyelashes and painted fingernails and even toenails. The fashions are very well made with beautiful fabrics from outside to inside, and many of the clothing pieces even include a Jem logo tag on the inside. As for the dolls that come with earrings, they are all in metal, and will have to get attached, since they are included as loose accessories. And the shoes are no longer plastic, but hand-made in more realistic looking materials. Also, each doll in the line comes with a stand, a certificate of authenticity, and special characteristic mementos in form of detailed miniature accessories. The shape of the stands was based on the 80's doll stands, but are now adjustable in height and with interchangeable connector parts "underarm style" for all dolls, and "saddle style" for the female dolls. What they don't come with anymore, is a hairpick of any kind, since they are meant to be kept as collector items as is. Also no cassette tapes nor poster. This new line is a complete new experience to those of us who were used to the 80's playline. Everything about these detailed new adult collector dolls is well done, from the boxes to every little accessory, and they need to be handled with a little care. When it was time to release a new wave of dolls for this line, members got an email sent with pictures and information about doll details, dates, and prices. And sometimes things like this was revealed via a an online webinar, an online video conference where members listened and asked their questions via a chat. Integrity Toys also host annual conventions where they reveal dolls, even if Jem dolls were usually not revealed there. The very nice people at Integrity Toys even made an official doll site, and are communicating with the collectors via their own forum, for those who are members of their club called Wclub. Where fans also talk to each other. 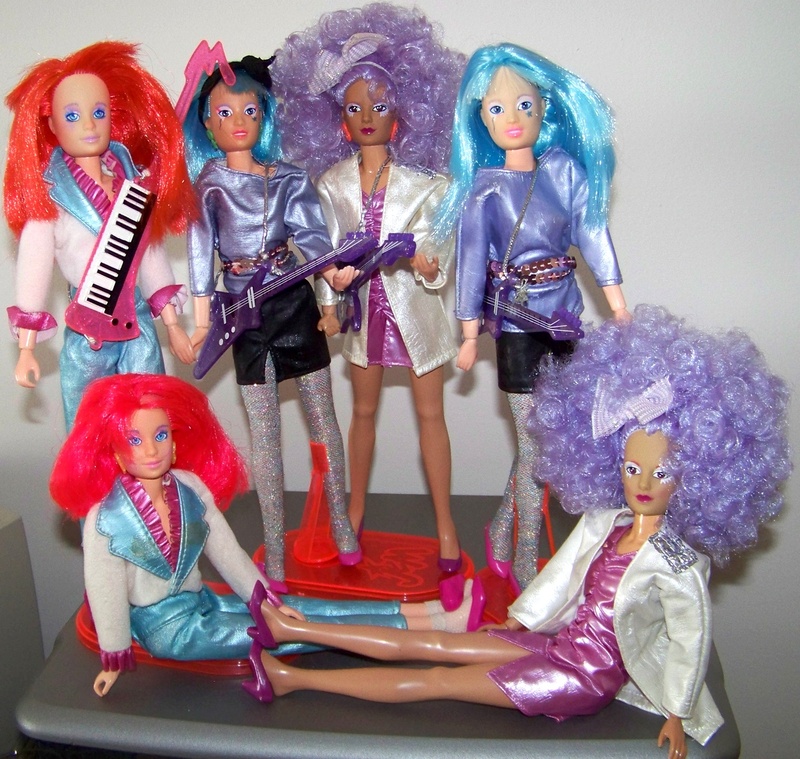 Each year, there were some special Jem dolls released, like a Wclub special, an upgrade special, and/or Comic Con special. In this guide you will find out things like: official presentation text from Integrity Toys, review of the doll with differences from the 80's doll, pictures of the entire packaging, pictures of the dolls from different angles, edition sizes, face mold information, promotion pictures, cartoon comparison, and clothing and accessory information and pictures from several angles. More about the instruments and in comparison to the cartoon. History of the doll line.